Transform your backyard, patio, or garden with this graceful planter. Made from the highest quality ceramics, it's destined to become a favorite item. An alternative material to clay or stone, fiberglass planters are resistant to cracking, fading, chipping, and will never rot. Fiberglass can mimic nearly any other material type, providing a lightweight planter that will endure and last season after season for years. 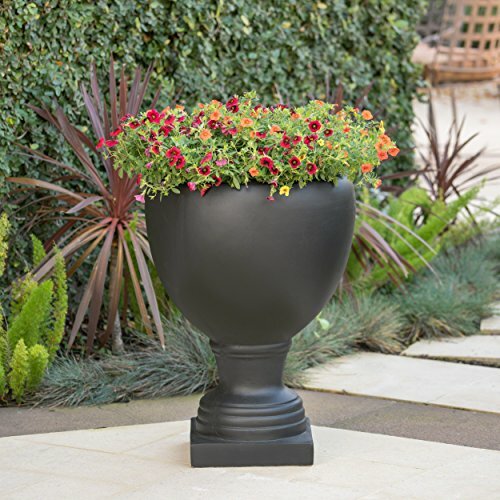 Their lightweight properties make this planter ideal for use as deck, balcony, garden and porch planters, easy to relocate around the patio should you wish. Transform your backyard, patio, or garden with this graceful planter. Made from the highest quality ceramics, it's destined to become a favorite item. An alternative material to clay or stone, fiberglass planters are resistant to cracking, fading, chipping, and will never rot.